Handling workloads generated by a large number of users, data-stream–processing systems also require large amounts of energy. To reduce their energy footprint, such systems typically rely on the operating systems of their servers to adjust processor speeds depending on the current workload by performing dynamic voltage and frequency scaling (DVFS). In this paper, we show that, although effective, this approach still leaves room for significant energy savings due to DVFS making conservative assumptions regarding its impact on application performance. 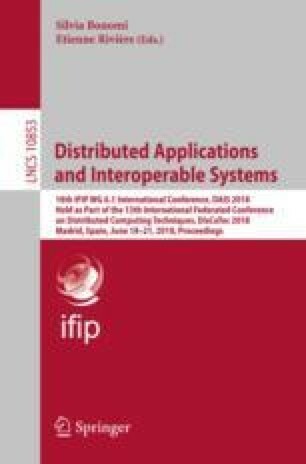 To leverage the unused potential we present Strome, an energy-aware technique to minimize energy demand in data-stream–processing systems by dynamically adapting upper limits for the power demand of hardware components. In contrast to DVFS, Strome exploits information on application performance and is therefore able to achieve energy savings while minimizing its effects on throughput and latency. Our evaluation shows that Strome is particularly effective in the face of varying workloads, reducing power demand by up to 25 % compared with the state-of-the-art data-stream–processing system Heron relying on DVFS. We thank Heiko Janker for his help towards a precise and accurate total-power measuring device and the anonymous reviewers for their insightful feedback. This work was partially supported by the German Research Council (DFG) under grant no. DI 2097/1-2 (“REFIT”) and grant no. SFB/TR 89 (“InvasIC”).